Quickly grab and turn logs with a rugged, boron steel hook featuring a toothed blade with a sharpened tip for better grip. 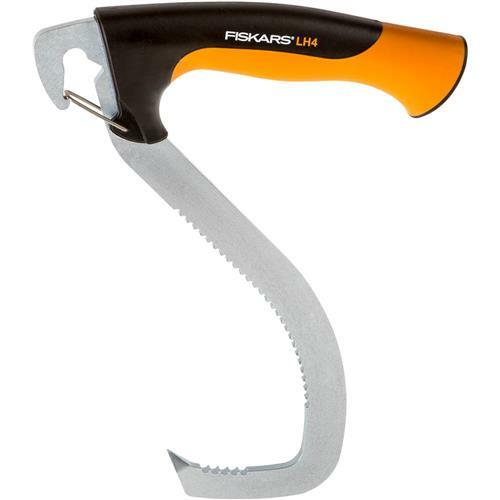 Prepare and organize firewood with a durable, comfortable log hook that can be used independently to turn logs or combined with other tools for transport. A hardened boron steel hook features a toothed head and sharpened tip that bites into bark for a secure hold. In addition, a compact hook profile makes it easier to access a log's base. A sculpted handle includes non-slip grip and a flared end for improved comfort, enhanced control and insulation against the cold. Plus, a durable holster simplifies storage and transportation.